1.Safety valve unit: It monitors the movement speed of the manipulator to prevent it from rising or falling rapidly after a wrong command is issued unintentionally or accidentally. 2.Non-return valve unit and gas tank unit to prevent air supply from interruption: It is to ensure that the manipulator, when air supply is interrupted, will not accidentally injure people. Operation of the unit can last 1 to 2 work loops. 3.Brake unit: The brake is located at the joint to prevent the manipulator from rotating and loosening. It also makes it easy for the operator to control the workpiece so that the manipulator and fixture can be stopped at any position. The brake is automatically sensed by the fixture. When the operator's hand leaves the operating handle, the manipulator is automatically locked, and the brake can also be used to park the manipulator after the work is over. When the brake is in the brake state, all the buttons of the manipulator do not function to prevent accidental injury. 4.Fixture self-locking unit: Designed with the shut-off valve function,the self-locking unit can prevent the fixture from loosening the object when the system is out of gas or leaks air at any position, unless the operator gives a command. 5.Load self-locking unit – in-place load protection: The designof load self-locking and in-place protection can ensure that the workpiece will not be released when the workpiece is not placed in the specified position, even if the "release" button is pressed. This design prevents the workpiece from non-human release. 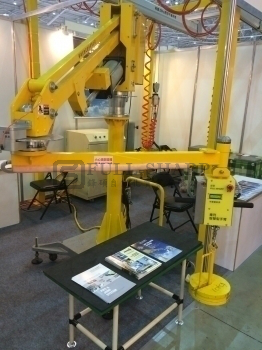 6.Load self-locking unit - load hanging protection: The design of load self-locking hanging protection can ensure that the workpiece is never releasedwhen it is in mid-air, even if the "release" button is pressed. If the operator stops pressing the "release" button, the manipulator and the fixture will return to the original balanced state; if the operator continues to press the "release" button, the workpiece will continue to be grasped and slowly descend with the manipulator to the designed lowest point. 7.Load self-locking unit-load limit protection: The design of load self-locking limit protection is to ensure that the fixture will not release the load, when the manipulator descends to the designed lowest limit position, even if the "release" button is pressed. In short, in any case, the workpiece is released only when it is placed on a stable contact surface. 8.Load detection air pressure ratio module: According to the actual load weight, this module can calculate the friction force that needs to be overcome in all parts of the whole system and the feedback position signal of the manipulator. It will then feedback the calculation to the control pressure-regulating valve to adjust the optimized balance factor, allowing the entire "smart counterweight balance hanging arm" to handle cargo in a near-zero-gravity state. 9.The status of the manipulator is displayed on the control panel screen at any time. ※ The load is automatically weighed in 0.5 seconds, and balance output is automatically calculatedto achieve the best balance in a zero-gravity state. ※ Even if the weight of the workpiece changes constantly during the handling process, the manipulator can automatically calculate the accurate balance output in an instant without any buttons pressed by the operator.